The cooling SEER is up to 7.53 and the heating SCOP is up to 6.23. Newly designed fins enlarge the heat exchange area and decrease air resistance, enhance heat exchange performance and save more energy. 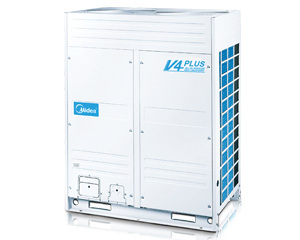 The V4+ R Series has an extensive range of capacities, from 8HP to 64HP, meeting all customer requirements from small to large buildings. Up to 64 indoor units with a capacity up to 130% of total outdoor capacity can be connected on a single system.